Welcome to my third week down! Can’t decide if I want to do a countdown but I keep coming back to it, so I guess I will. Wow, what a week though. I did get lots of work done amongst my crazy, busy life. 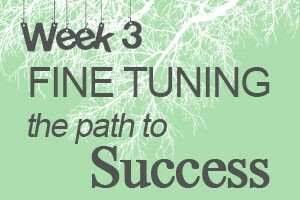 The biggest challenge for this week was creating my Opt In. First deciding what value I was going to bring to clients. I started heading down the wrong path with it but then was able to quickly correct myself when I asked the questions “Will this benefit my client? Will this be something my clients will be interested in?” Once I was able to answer “yes” to those questions, I knew I was on the right path. I was also able to get clarity on this after my initial strategy session with my business coach. Speaking of business coach…I met with her and it went very well. One of the things that I loved was that she recorded the session so I can go back and review it to take more notes of our discussion. Being that I received the recording last night, I haven’t had the chance to go through it, but I will and tell you all about it in another post. Overall, I feel that this week was very productive and went well. But, I do feel I set up TOO many goals for myself. Big mistake! I don’t want to set myself up to FAIL. I’ll need to work on spreading out the goals so that I’m moving forward at a realistic pace but NOT stuck in a discovery and/or design phase either. Installed and integrated Sumome plugin. Wrapped up 1st client’s website. Success! Confirmed appointment for another client site. This is for another freebie that I’m doing to build up my freelance portfolio because most of my work is from corporate. I also have another client interested in redoing her website. It is in desperate need…OMGosh! Organized my computer files, they were such a mess. I don’t want to waste time searching for things when I need them. Set up WordPress backup plugin for my website using WordPress Backup for Dropbox. This was free so I’ll use this for now as I investigate more options. Had a major brainstorming session for blog content ideas. If its for 1 per week, I’ll have over a years worth. It was a major breakthrough so I let the floodgates open and went with it. AND it was all focused on things that would be valuable for my clients. Installed security protection on my WP site using the Wordfence plugin. Met with business coach and my SKIN is totally in the game. Going to commit to three months of coaching. Purchased book on branding. Did a search on Amazon with keyword “branding for business” and up popped up Branding: Create Your Difference Through Smart Branding. Only .99 cents. I’ll let you know how it goes. Designed and created Opt In for my website. Felt like I birthed another baby in process…omgosh…TWIN babies that is! Take 15 min each day to build Twitter following. Totally nailed this one and saw an increase in my following and engagement. Write weekly journal entry. Here I am writing this entry! Check! Reach out to 5 people regarding websites. Layout content schedule for this with in CoSchedule. I REALLY need to get onto this. Although I did do some planning, but only did it for a few days out at a time. NOT good. I need to get my game together on this crucial part of my online business. Reach out to people regarding small business networking. Conferences? Local networking? **Learned that this may not be a good idea until I figure out who my target audience is. Sumome – tool to grow Email List, social sharing and analytics. Lots of different parts to it. LOVE this plugin! Wow! Easy to install, customize and integrate with WordPress. Uji Countdown – HTML5 Customizable Countdown Timer – saving this one for when I hold Webinars or online instruction. WordPress Backup to Dropbox– Testing this plugin out to do my daily backups for my website. It’s a pretty light site a the moment so I’m hoping this will hold me over until I can find something different. Meanwhile, it was very easy to setup with Dropbox. Successfully did database backups. Wordfence – wordpress security protection from hackers getting in your site. Login Security Solution – help protect hackers getting in through the login. Force users to use stronger passwords, including yourself to keep your site safe from hackers. Think I’m going to create a page with all the plugins I find useful as a resource page that I continually update. Set up account with iTunes and Stitcher radio. Record, edit and post podcasts 1-3.
Review strategy recording that I had with business coach and write a blog post about it. Layout content schedule for this with in CoSchedule. Create a website resources page. Create a resources link on my website. Finalize Opt In page and see if its ready to implement. Figurative painter, website designer, podcaster, traveler, gamer, food lover, photo journalist, mom & wife.